RAV4 delivers more fun with a powerful 176-hp 4-cylinder engine for off-the-line thrills. The Dual Variable Valve Timing with intelligence (VVT-i) technology helps maximize while boosting RAV4's fuel economy too. It all helps make RAV4 a smart, spirited choice. Whether you're looking for extra thrills or extra efficiency, RAV4 gives you up to three selectable driving modes to help you customize your drive. ECO Mode helps maximize fuel economy, Sport Mode provides a more spirited drive, with thrilling acceleration and revised shift points. And on RAV4 Hybrid, EV Mode lets you operate solely on battery power under certain conditions. Each RAV4 grade comes with a wheel designed to match its distinct personality. LE comes with 17-in. steel wheels with wide-vented spokes, while XLE Hybrid comes with stylish 17-in. alloy wheels. Limited features 18-in. alloy wheels with SuperChrome finish, and SE comes with a sporty 18-in. machined alloy wheels-each with their own signature look. 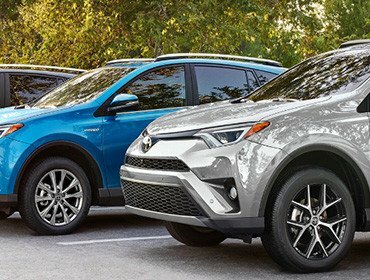 Leave a lasting impression, no matter which RAV4 you choose. More friends and more gear means more possibilities. You can quickly reconfigure the rear seats into a 60/40 split and fold the second row seats down to create a wide, easily accessible load space with up to 73.4 cubic feet of cargo capacity. With the available cargo net hammock you can stow your cargo safely no matter what you want to carry. It's flexible design lets you create different configurations so you can bring more of what you want on your next adventure. A smart way to stay connected and see things more clearly. With available integrated HomeLink®, you can easily control your garage door, front gate, and home security system from inside your RAV4. Add the available power tilt/slide moonroof and let the great outdoors in. When the sun is too much, just slide the sunshade closed to keep your cool as you carry on. By illuminating a warning signal on the correct outside mirror, the available Blind Spot Monitor (BSM) and Rear Cross Traffic Alert (RCTA) help identify vehicles that you may not see when changing lanes or backing out of a parking space. The Pre-Collision System with Pedestrian Detection (PCS w/PD) helps keep the road safe by detecting pedestrians in certain situations. By combining millimeter-wave radar with a camera capable of shape recognition, the system provides an audible warning and a display notification to alert you of a possible collision with a pedestrian under certain circumstances. If you don’t react, automatic braking and collision avoidance support is then given to help prevent a collision.